Do you need to choose colors for your bathroom, but aren’t sure where to start? After our recent miniseries we pulled our methods into an easy-to-scan infographic. 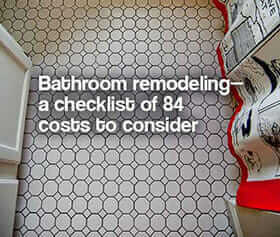 Our formula can be applied to virtually any bathroom with any color of tile and fixtures. And really, it can be used in virtually any room that has you frozen in your decorating track. We’ve distilled all of our bathroom decorating advice into five easy steps + tips on how to add more light, understand visual gravity and Pam’s 60-30-10 rule for choosing colors. First, you need to determine your main fixed color. This will likely be the color of the existing wall tile in your bathroom, since it likely covers more than half of the total wall surface in the space. You can “play it up” or try to “play it down,” but you can’t get around it. Your floor tile and/or bathroom fixtures may also be this color. Basically, your main fixed color is the color that is the most prominent color of the elements in the room that are attached and not easily changed. Main color: Pink. Fixed accent color: Ruby. 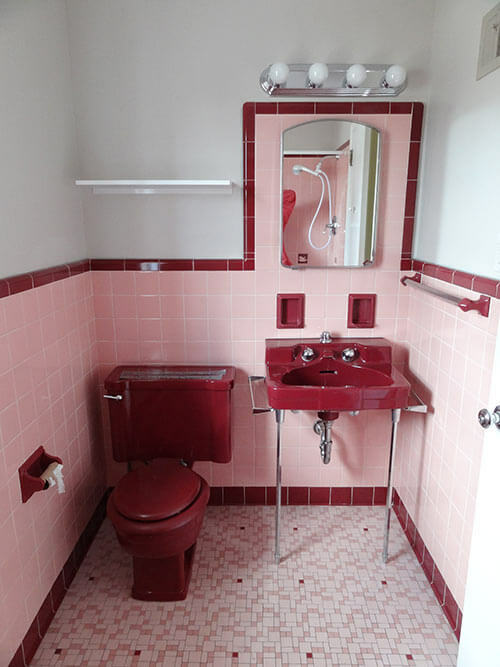 From the story: A color scheme for a pink, maroon and white bathroom. If you have other fixed colors (in lesser proportions than your main fixed color) in your bathroom, they must be taken into account. 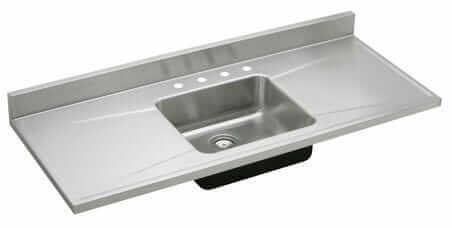 Fixed accent colors often are found in fixtures, bullnose and floors. If so, these likely must be a part of your overall palette. Unite your fixed colors in one patterned piece: Pam’s bathroom, two completely different looks, just based on changing the wallpaper. BUT each wallpaper did include her exact tile and trim colors. Unite your colors in a patterned piece: Diane found Lily Pulitzer fabric that matched her pink tile and created valances. She pulled a green from the fabric for her wall color. Now that you have identified your main color and your secondary color, it is time to unite these two (or more) colors into a patterned piece that will help pull the room together and can even help you determine an accent color or two for your room. You’ll want to find wallpaper, a shower curtain or wall art that contains all the colors you will use in your bathroom. Ideally, the pattern will include the exact shade(s) of your wall tile, colors of any other tile in your bathroom and then, additional colors that the pattern designer collected. The good thing about finding a patterned piece is that it likely already reflects effective color combinations chosen by a professional designer. Within this pattern, the designer will have selected other colors that go well with your fixed colors. Note, it is possible to have pattern in two places (such as wallpaper AND shower curtain) — but we’re not going to go into that, because this is a “foolproof” guide. Suffice to say: If you start layering patterns, study up. Be cautious of: Grids — Since the wall and floor tile are already strong grid designs in the room, you’ll have to be wary of adding yet another grid. Too many grids can make the room feel forced, uncomfortable to the eye and even cage-like. It is generally more foolproof to choose a wallpaper or shower curtain design with a more free form pattern that is not too geometric to avoid the overuse of grids in the space. Be cautious of: Scale — Another aspect to consider when choosing a patterned piece is scale. Vintage bathrooms are typically small spaces, so for foolproof design success, avoid overpoweringly large patterns — that is, unless you are consciously going for a bold graphic look. [For bold graphic ideas, see our 99 pink bathroom designs — we show plenty of ways to do this.] Scale is also important when choosing wall art for a small bathroom. Typically the wall tile in vintage bathrooms covers more than half of the available wall space, leaving relatively small sections of wall for hanging art. A large piece of art that takes up all the available wall space may make the space feel claustrophobic; a grouping of smaller pieces with some space around them can provide something interesting to look at without making it feel forced. Edit. 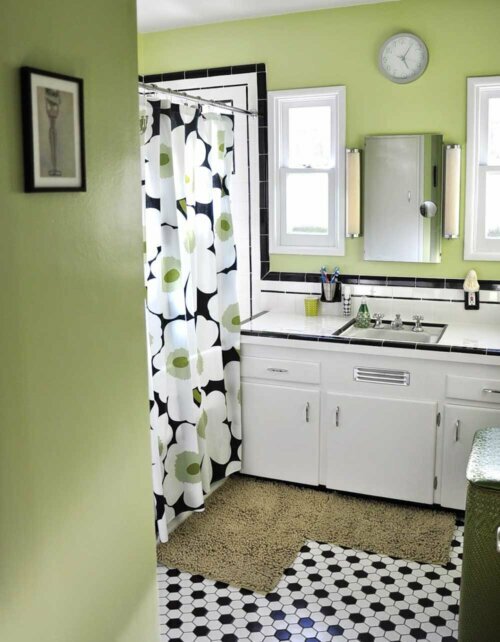 To choose a paint color, pick a color from your patterned piece: Dawn used a green from her Marimekko shower curtain as a paint color in her new black-and-white bathroom. 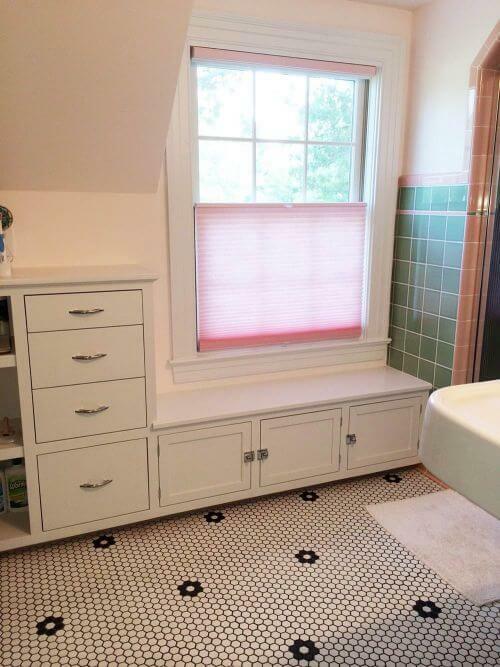 To choose a paint color, tint a main or accent color: Jane started with the color of her pink tile and fixture trim and then tinted the color (added white). From: See Jane design: A vintage style green and pink bathroom. If you’ve chosen wallpaper, use the same process to choose a color from the wallpaper for your shower curtain, or use a neutral (we like soft whites). Pam always looks at the “field” color of the wallpaper first to consider for a shower curtain color — this can result in lovely harmony. Use accent colors in the accessories: Kristen pulled gold from her patterned piece (her window valance fabric) for here wall color, and used lots of black in her accessories — note the tape on the horizontal blinds, even. 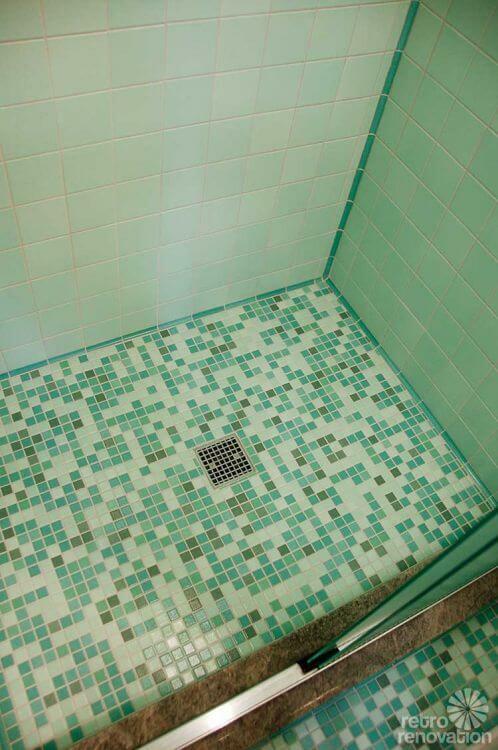 : From Kristen and Paul’s 1940s style aqua and black tile bathroom, built from scratch. Next, what is a “third” color from your patterned piece that you can use sparingly as an accent throughout? This is a good place to be contrast-y (go opposite your field tile) for visual dynamism aka “pop”. Use this color for… accents like towels, rugs, maybe a valance or café curtain or soap dish. 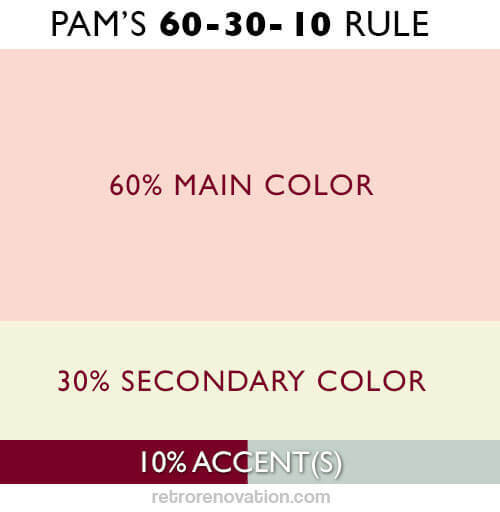 But don’t overdo it, or it’s no longer an accent – see Pam’s 60-30-10 rule. Towels and rugs: Use your main color, your secondary color, your accent colors – mix and match. Decorations on the wall: Color also should relate to your overall color scheme. Group in odd numbers, make sure you use the “white space” around them to frame them effectively. Visual gravity: Nice example of using visual gravity in this bathroom design — Rebecca and Keith brought darker accent colors onto the floor of their (new) midcentury modern bathroom. 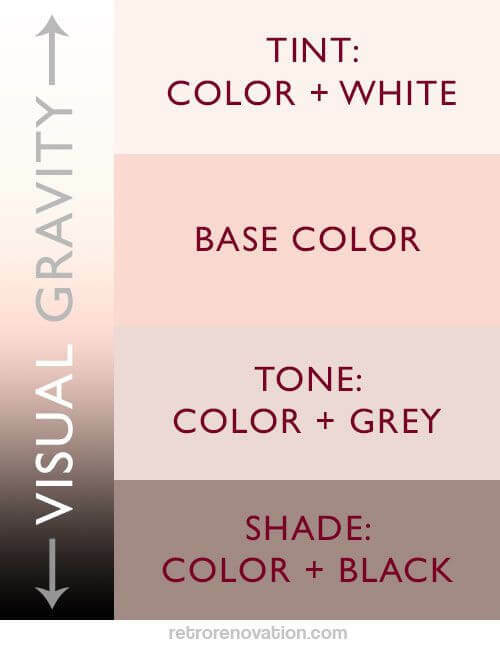 Visual gravity refers to the feeling that the decor in a space is ‘grounded.’ “Visual gravity” is comfortable to us. Lighter colors up high, deepening darker as you do down. Just like in the world: Sky is light, trees are medium, ground is dark — we feel grounded, safe. If in doubt, use this principle for your bathroom design too. That is, beware dark bold colors on walls above pastel tile unless you are consciously going for that topsy-turvy effect; and, beware of entering the room when you have a hangover. Are your fixed colors warm or cool? 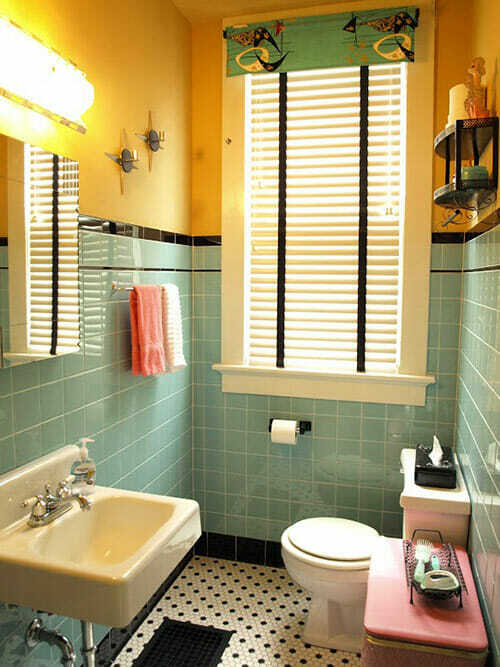 This is actually a whole ‘nother big topic in and of itself, but in short: Are the fixed main and secondary colors in your bathroom both warm (pink, yellow) or cool (blue, green) colors — e.g. ‘Red is hot, blue is not’? Or, do they combine a warm and cool color scheme? Take this into account when you are choosing an accent color and deciding on a wall color. If your bathroom is predominantly cool, adding small warm accents can really make the accent color pop off the cooler background, whereas if your accent color is also a cool color, the accessories and art you choose will have less of a visual impact because they mesh more closely with the color temperature of the space. If your bathroom has a window that gets a lot of warm afternoon light and you want to make it feel visually cooler, you can add cool colors to the space, whereas if your bathroom always feels cold, adding some warmer colors can help it feel more comfortable and cozy. Note: Chrome is cold and actually a contrast for most vintage bathrooms which tend to be warm even if they are “neutral” example: warm grey, warm white, etc. 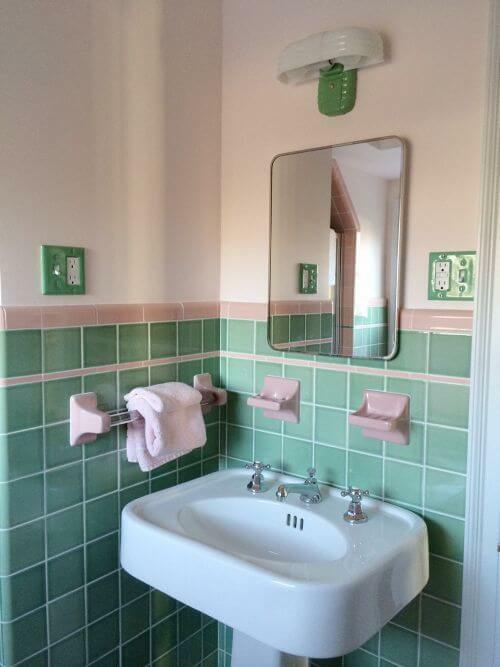 From the story: See Jane design: A vintage style green and pink bathroom. Need more light in your bathroom? Painting the ceiling white and shining a ceiling light, centered in the bathroom, up onto it helps to reflect the light all around the room, giving it the feeling of being filled with light. Putting lighting above or framing your mirror has a similar light bouncing affect. 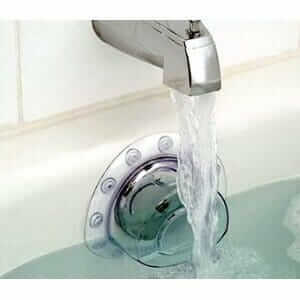 Add more light in your tub or shower area by putting a combo light/vent fan on the ceiling over your tub shower, which will help light up this small, enclosed space. Remember to put your vent fan on its own switch and add a timer! On your window, use a translucent light filtering shade (like a pleated shade) that can deliver privacy but still radiate the natural light coming in from outdoors. Make sure it is easy to pull up and down — use it! Another solution: Put frosted/privacy glass in your window — or use the stick on privacy film — to let in the most light possible while maintaining privacy. Get to know the Light Reflective Values of your paint choices. For your walls, choose a paint color that reflects light, not absorbs it. Keep your bathroom vanity a light- or medium-toned wood, or white. Dark wood=black hole. Similarly, beware of black, gray and dark-toned everything — tile, floors, shower curtains, fabrics, countertops – they will absorb light rather than reflect it. Love the house you’re in! I always put a Solatube centered above the sink/vanity. It’s the best light, and lights the whole bathroom. You can get them with a light and/or exhaust fan built in, if you need them.